New Year, New Makeup! Isn't that a thing? I for one think it should be. Drugstore beauty products are one of my favorite things to try for many reasons. First, I don't feel right splurging too often on high end makeup that I will probably never use up - because I have so much already. 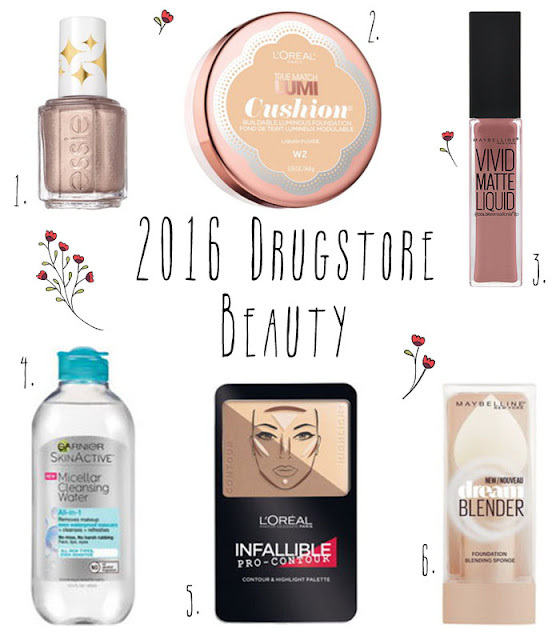 Second, the drugstore brands have become amazing. Third, it's just so much fun! Who doesn't love going to the drugstore for Tylenol and coming out with a brand new mascara or lipstick? Here are a few hot new things I cannot wait to try this month. 1. Essie Sequin Stash nail polish from the Retro Revival Collection. It looks like a ballerina in a bottle. With sparkles. How could I resist? 2. L'Oreal True Match Lumi Cushion Foundation. I may or may not have already bought this. 3. Maybelline Vivid Matte Liquid Lipstick. Because Maybelline does lipstick right. 4. Garnier SkinActive Micellar Cleansing Water. I have tried the pink version that has been out for a while in France, and this one intrigues me. 5. L'Oreal Infallible Pro-Contour kit. I love contouring and that cool brown sculpting powder looks pretty promising. 6. Maybelline Dream Blender sponge. I'm not sure how I feel about a sponge on a handle but it just looks so pretty. Do you get excited about new makeup releases? I'm interested in that contour kit!